One of the most important things is to start with a strong mould that can last through 4 beams. We have used plywood covered with resin and form-ply. An easy way to make the fillet around the edge is with plasticene. It is quick clean fillet but it will have to be re-filleted with each beam (a ring spanner works well to smooth the fillet as the excess plasticine is extruded through the hole). It�s best to use soft wax over plywood but I used hard wax over painted moulds and it works well. Scarab 18 Female beam mould made from form-ply. Cutting the glass is a bit time consuming but it is a job that can be delegated to a willing helper. 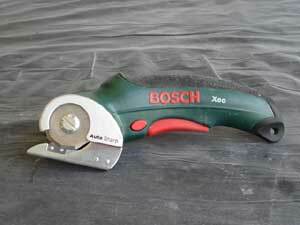 Scissors will quickly become blunt when cutting the glass mat so I have found the Bosch cutter a handy tool. It is self sharpening and can be used for carpet as well. 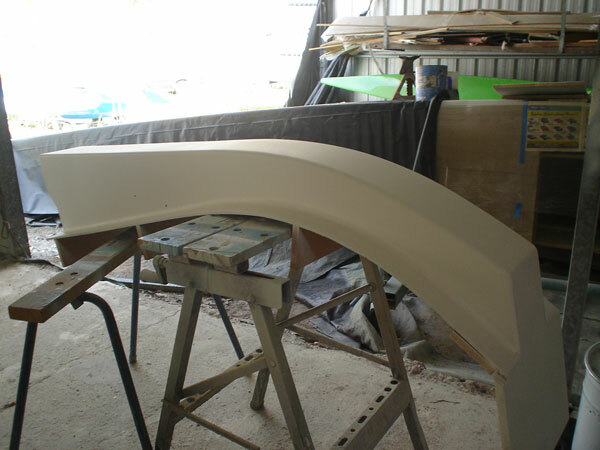 We have found that there are air bubbles in the surface of the beam, difficult to remove before painting, unless gelcoat or resin containing filler(aerosil) is used as the first coat. 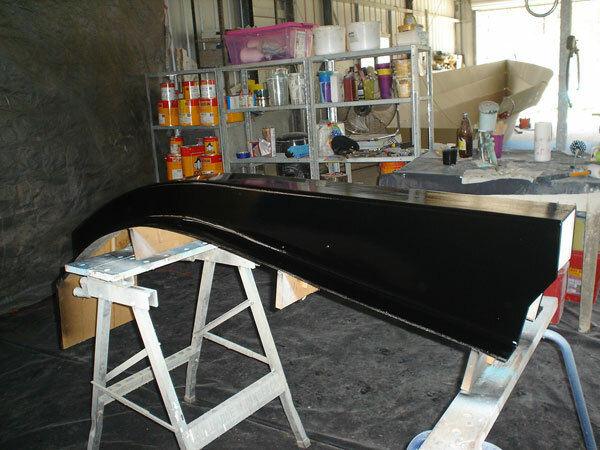 We use polyester un-waxed (laminating resin) except for the final coat of resin which contains wax. 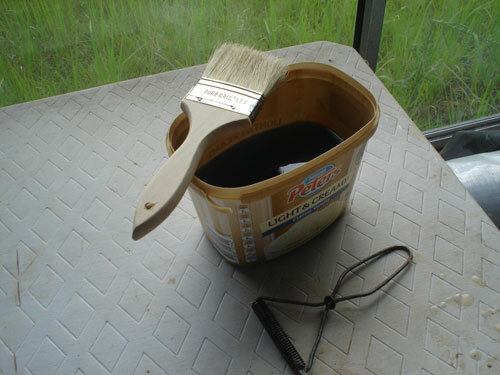 If you use un-waxed resin laminating can be spread over several days. This gives me time to rest and prevents too much heat building up which will cause shrinkage and distort the beam. We use a thin CSM (chopped strand mat) layer as the initial layer and that gives a smooth finish that is ready to paint. 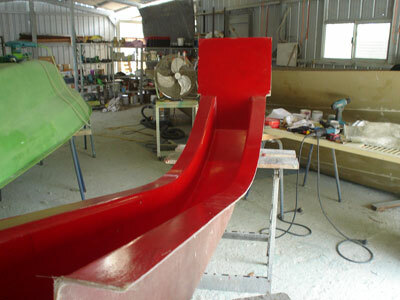 The first beams I built were made with epoxy which was very stressful. It was a large boat and the each beam needed to be completed in one day. 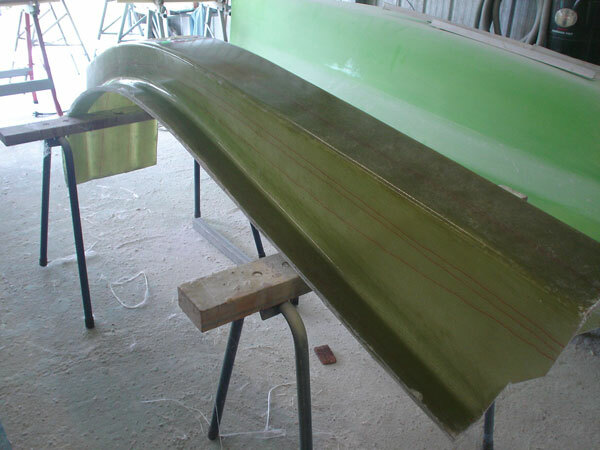 After that stressful time I developed an epoxy allergy and thought my boat building days were over. 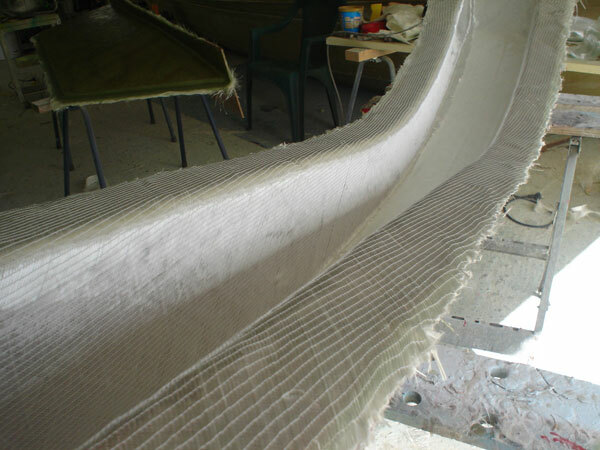 Since using polyester I�m back on track and enjoying every day building. 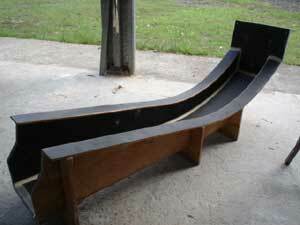 Although building beams is not my favourite boat building activity, it�s not so bad. By using polyester laminating resin the job can be spun out over many days and I use the activity as a fill in job. Some people insist on using epoxy resin but in Australia it is now about 6 times the cost of polyester and there are horror stories of people who have developed allergies. I always use a mask and cover up when using polyester but so far no problems. A tooling gel female mould was made from a plywood mould painted with Jotun pengard and Imperite. It is not necessary to go to this much work but we wanted to use the mould for more than 4 beams in the future. Made using a plywood female mould.